I've been writing in this little blog for about a year and a half, and I just recently discovered the stats tab on Blogger. Stats tells you everything you're dying to know: the location of your visitors (by country, don't worry I can't tell you're at the Starbucks around the corner. Or can I? ), how many people have looked at your blog in the past hour/week/month, and where they came from. All of this is very useful if you're trying to entice companies to put ads on your blog. But my favorite feature is knowing what people search for in Google that randomly points them to my blog. Not for advertising purposes. For fun. A recent search term: bieber monocle. 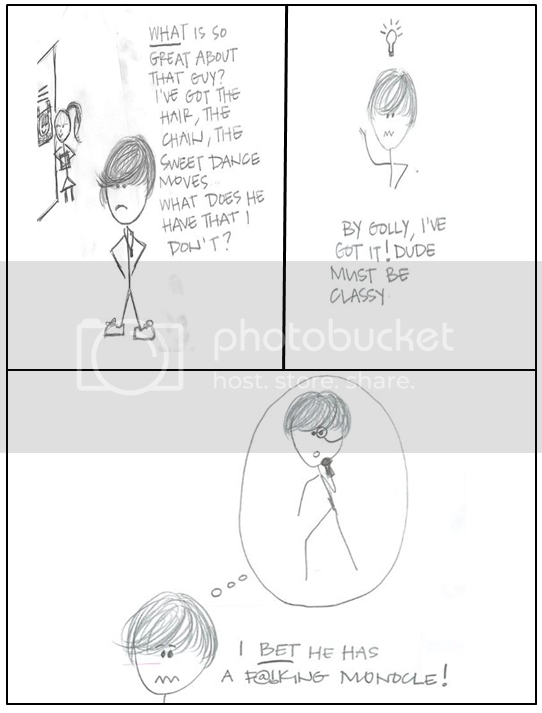 The scene: a love-struck teenage boy doesn't understand why his crush is in love with Justin Bieber -- and not him.